(10%) Problem 1: Point charges of 0.22 μC and 0.77 μC are placed 0.65 m apart Banchi, Stephen- banchis3@students.rowan.edu @ theexpertta.com- tracking id: 2N74-2F-82-4A-BAAB-13083. In accordance with Expert TA's Terms of Service. copying this information to any solutions sharing website is strictly forbidden. Doing so may result in termination of your Expert TA Account. 50% Part (a) At what point along the line between them is the electric field zero? 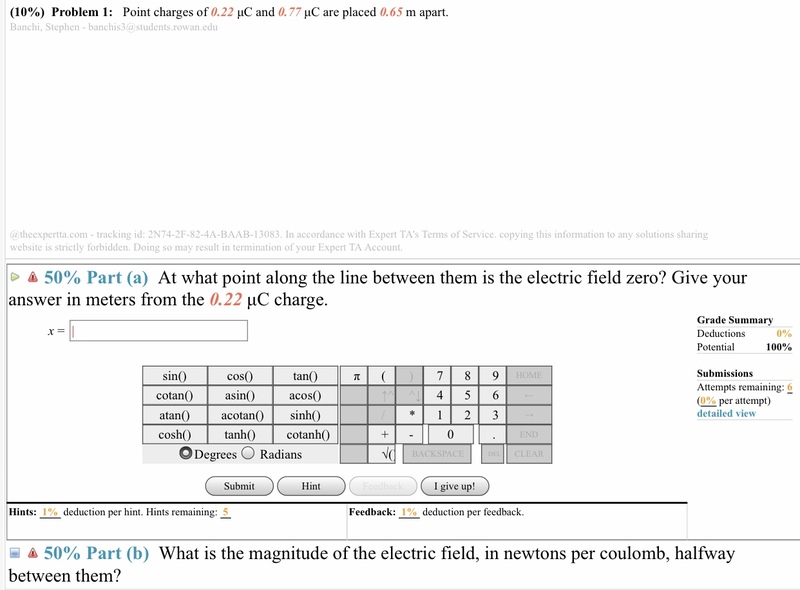 Give your answer in meters from the 0.22 μC charge. Grade Summary Deductions Potential 0% 100% tan( asin)acos0) sinh0) Submissions Attempts remaining: 6 (0% per attempt) detailed view HOME sin cotan atan()acotan( coshO cos0 4 5 6 cotanhO 0 END O Degrees Radians BACKSPACE CLEAR Submit Hint I give up! Hints: 1% deduction per hint. Hints remaining: 5 Feedback: 1% deduction per feedback. - 50% Part (b) What is the magnitude of the electric field, in newtons per coulomb, halfway between them?